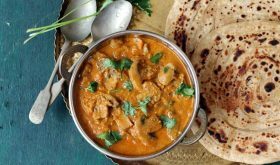 I am sharing a comforting and extremely flavorful restaurant style mushroom masala curry that uses simple ingredients. A pretty straight forward recipe that’s easy to make for even newbie cooks or bachelor cooks. 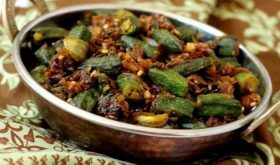 In most Indian restaurants you will find that this Indian vegetarian dish is very popular and usually served with butter naan, kulcha, lachcha paratha or any flavored pulao. Its silky creaminess with alluring looks and delectable taste is sure to warm up your soul. We can make many variations of mushroom masala curry by tweaking a few ingredients and spices. 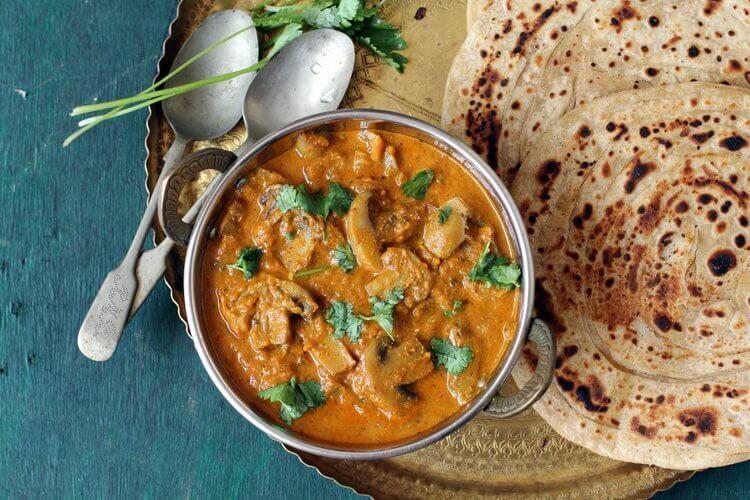 In today’s recipe of mushroom masala, sliced mushrooms are sauteed before being simmered in a subtly spiced, creamy sauce that has an absolutely addictive flavor. Basically we begin by browning chopped onions, minced ginger, garlic and green chilis and grind this mixture to a paste which lends body to the curry. 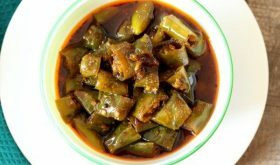 The ground paste is sauteed along with blanched tomato puree and mildly spiced with dry roasted aromatic spices like black pepper, cloves and cinnamon. Very few spices go into it and the main secret ingredient that gives the dish its creamy texture is cashew nuts. I soaked the cashew nuts in warm milk before blending it to a smooth paste and added it towards the end of the cooking process. Coriander leaves lend a fresh flavor and color to this vibrantly colored mushroom masala gravy dish. Vegans can avoid milk and replace it with normal water or coconut milk. You can serve mushroom masala gravy with chapathi, naan, pulao and biryani. 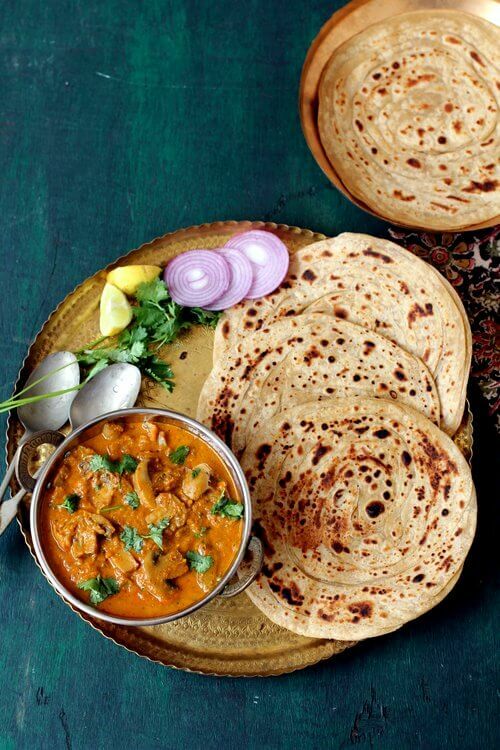 I served it with lachcha paratha and it made for an appetizing, warming meal. 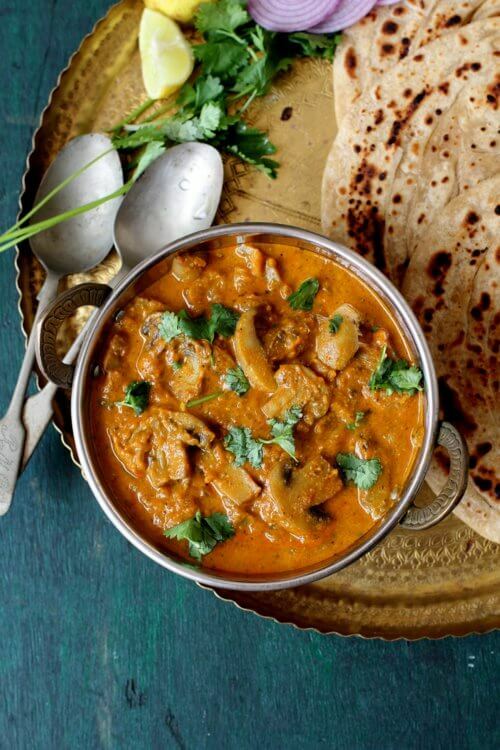 Do give mushroom masala curry a try and you are sure to get mesmerized with its delicious taste and the ease of the curry preparation will see you making it quite often in your kitchen. You should be adding this vegetarian delight to your Indian food recipes repertoire! If you are a fan of mushrooms, you can check out mushroom recipes that include mushroom pepper fry, mushroom fried rice and mushroom fry indian style. Heat half a tbsp of oil in a cooking vessel, add the sliced mushrooms and saute for 2 mts. Set aside. In the same vessel, add a tbsp of oil and add the sliced onions and green chilis and saute for 4 mts. Add the minced garlic and ginger and saute for 3 mts on low medium flame. Turn off flame, remove to a bowl, cool and blend to a smooth paste. Heat the remaining oil or ghee, add the ground paste and saute for 3 mts. Add turmeric powder, red chili powder and mix well. Add tomato puree and cook on low-medium flame for 7-8 mts or till oil separates. Add 1 cup water, jaggery or sugar and salt and bring to a boil. Add the sauteed mushrooms and simmer for 10-12 mts or till mushrooms are cooked and the desired curry consistency is achieved. Add kasuri methi, ground garam masala powder and cashew nut paste and mix well. Adjust salt, if required. Turn off flame. 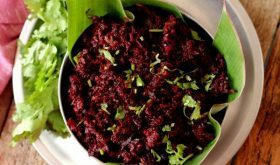 Remove to a serving bowl, garnish with fresh coriander leaves and serve with chapathi, naan or pulao. You can add a tbsp of cream or malai towards the end of the cooking process for a richer flavor.